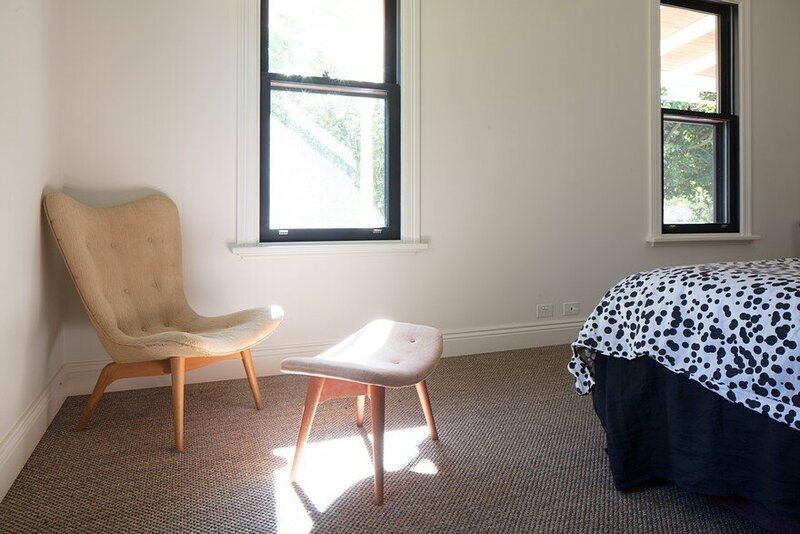 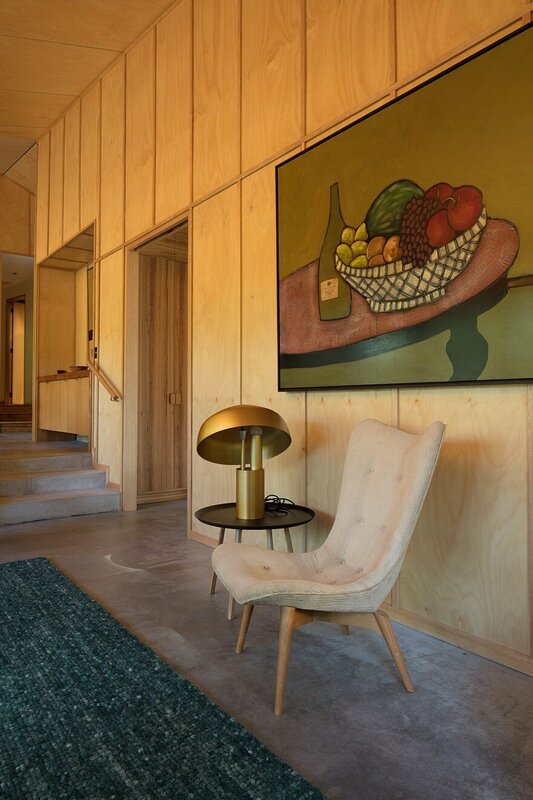 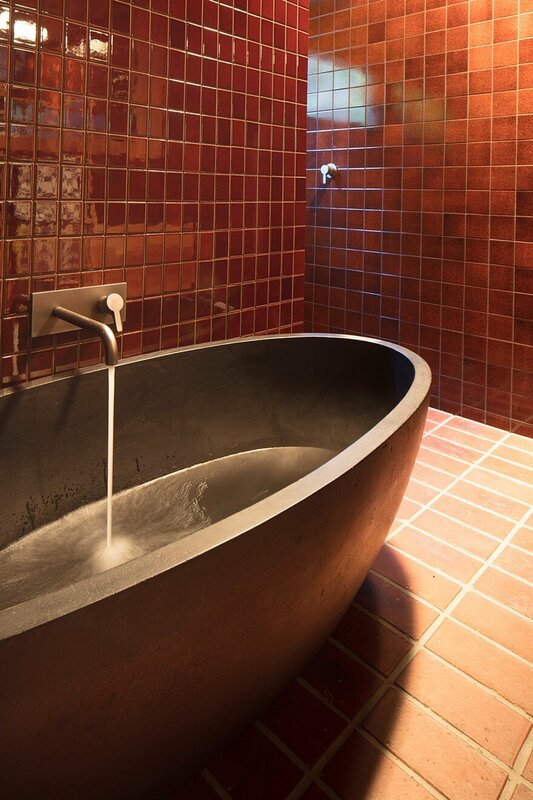 From the architect: Our clients came to us with a desire to create a renewed connection with the Daylesford property they have owned for over twenty years. 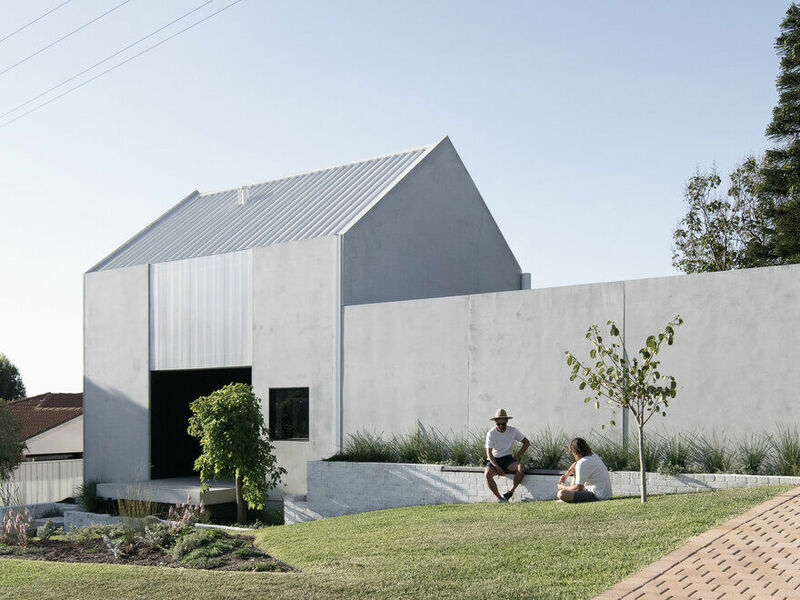 They didn’t have a grand vision but rather a sympathetic and caretaking approach to the land and a wish to create a permanent home. 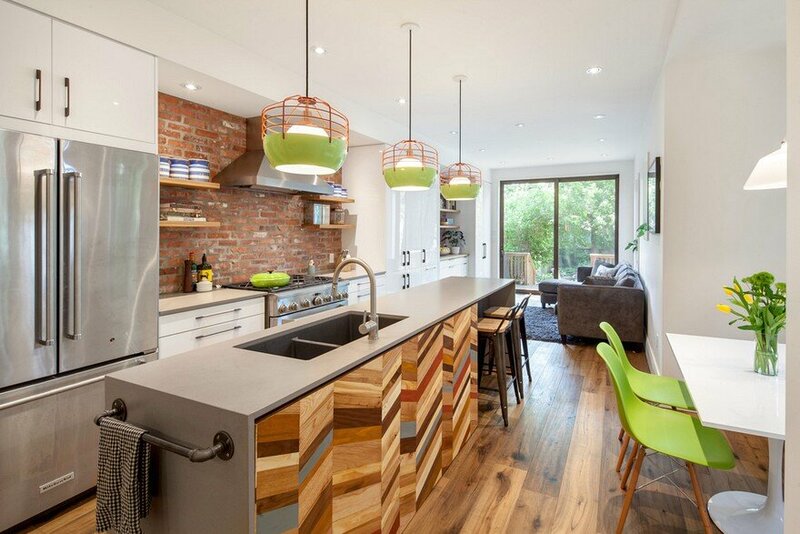 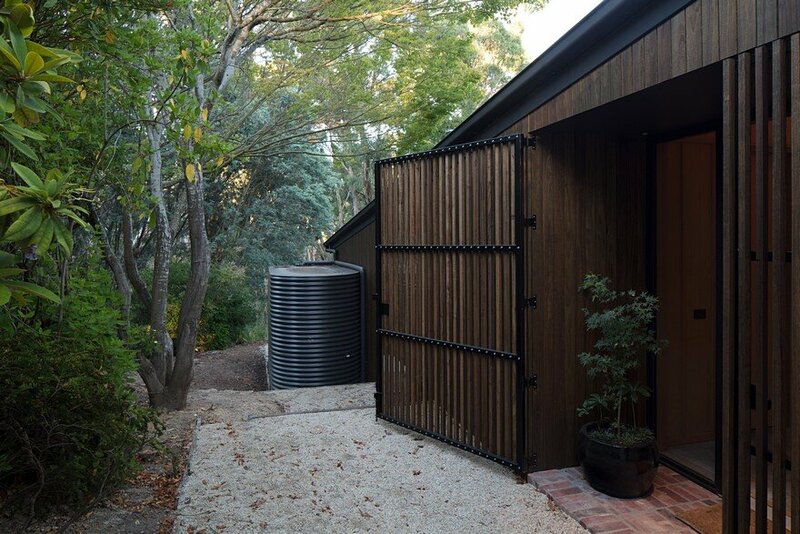 We were given the option to demolish the existing structure and design an entirely new house. 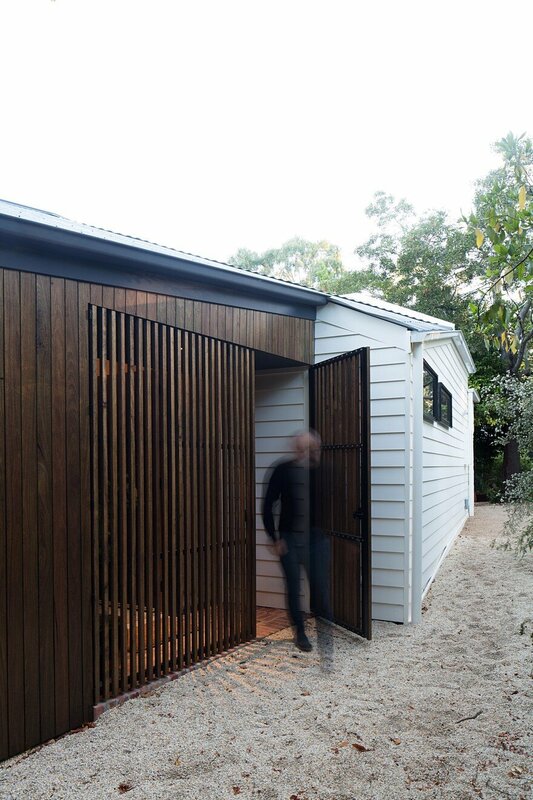 We established the optimal siting for a home was in the existing location so proposed instead to retain the original Victorian cottage, and only demolish a series of increasingly shoddy lean too additions and reinstate the original front verandah to retain a connection with the history of the site. 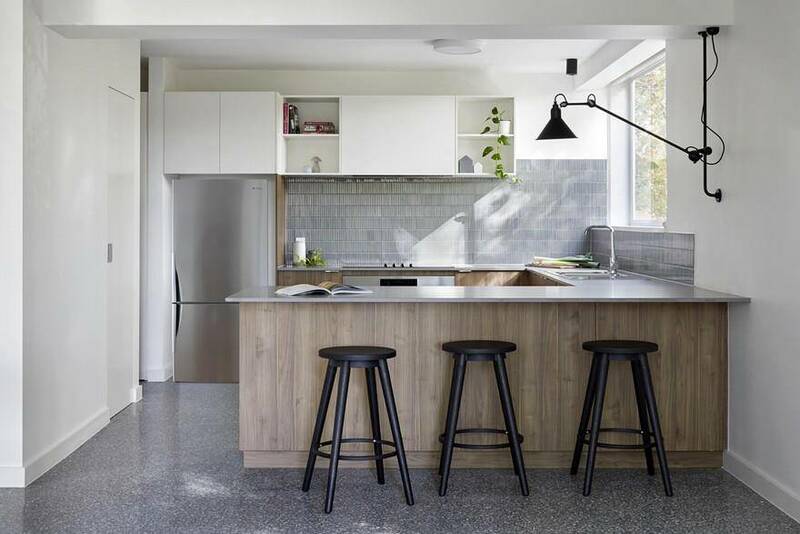 Located beside Daylesford Lake, in the foothills of the dividing range; the higher elevation means for a cooler and wetter weather than that found in Melbourne. 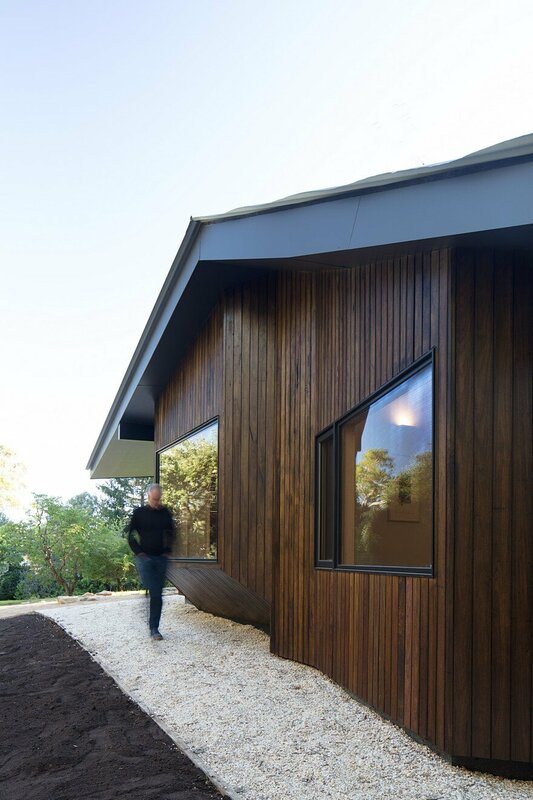 Shadow Cottage Daylesford responds to the landscape and climate context in which it is sited. 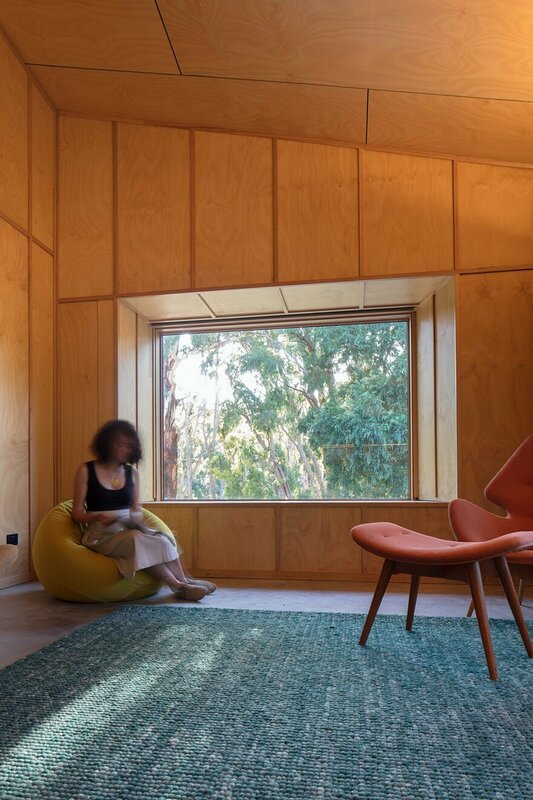 Living areas are orientated to north and to the west as the house drops away to capture views of the towering eucalypts in the nature reserve. 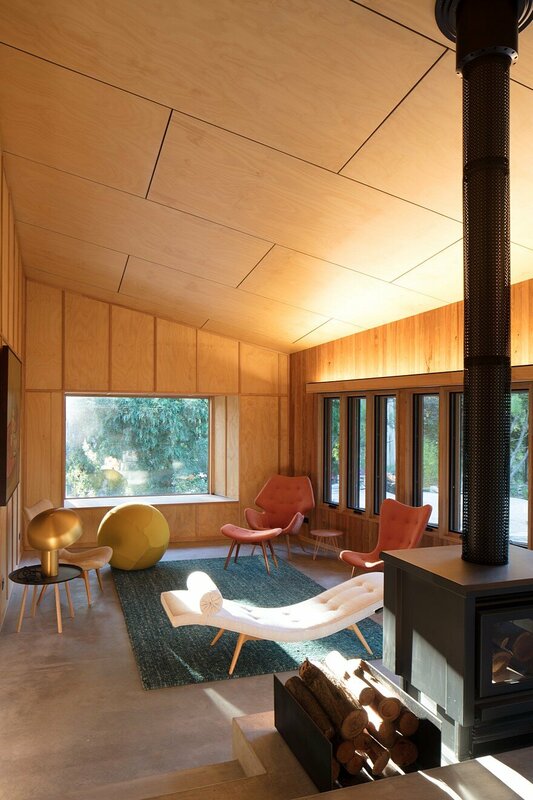 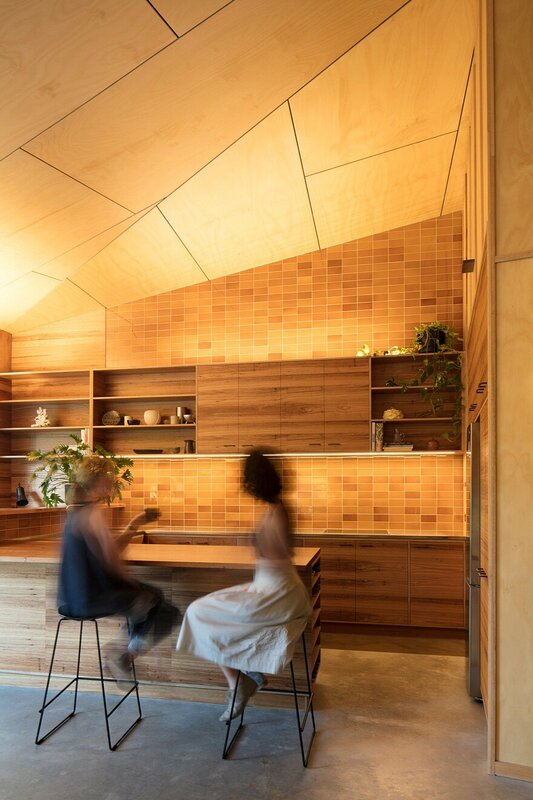 To the east is the original Victorian workers cottage upgraded to meet the bushfire standards. 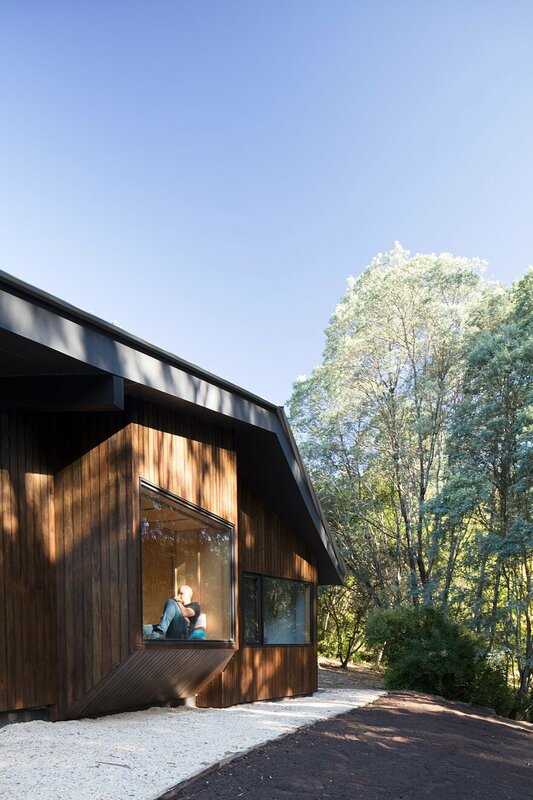 The addition doesn’t touch the ground lightly but rather hugs close to the ground and focuses attention to the backdrop of trees appearing as a contemporary mountain cabin when viewed through the bush below, in contrast to the prim Victorian viewed from the street. 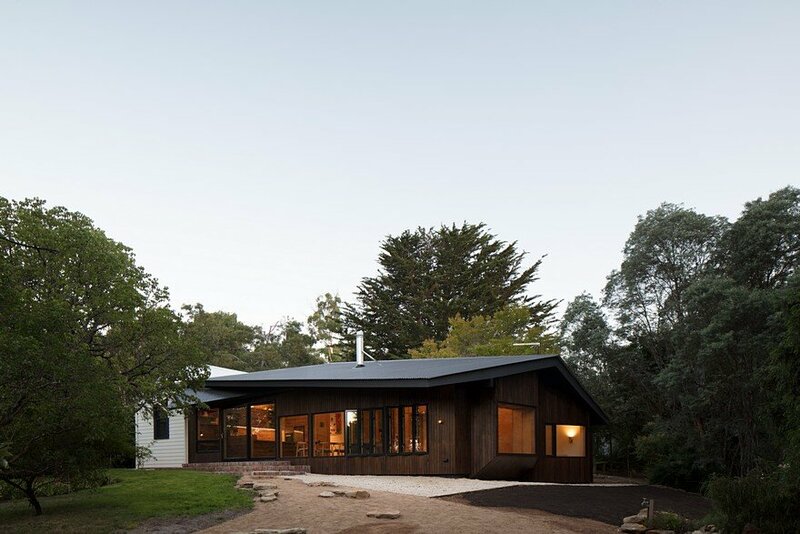 Conceptually the new addition was designed as a long shadow of the original Victorian cottage, the early morning shadow of the cottage cast into three-dimensional form, a shadow projecting from the cottage and casting down into the nature reserve. 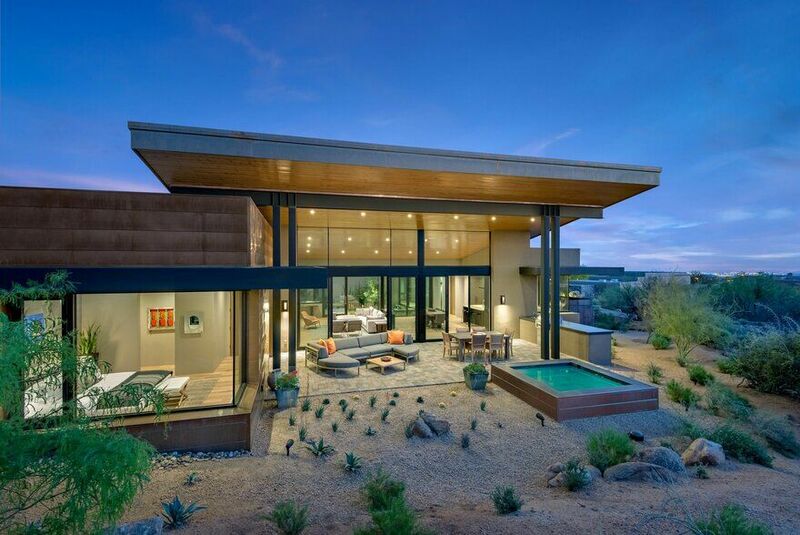 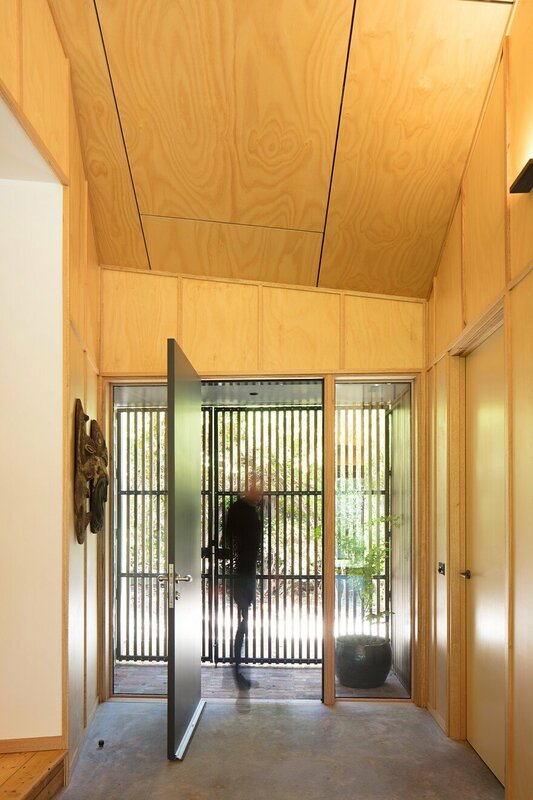 The consideration of shadow in the design also led to the over sized eave to the west responding to the suns path and a desire to recede from the sun as it moves into the afternoon sky. 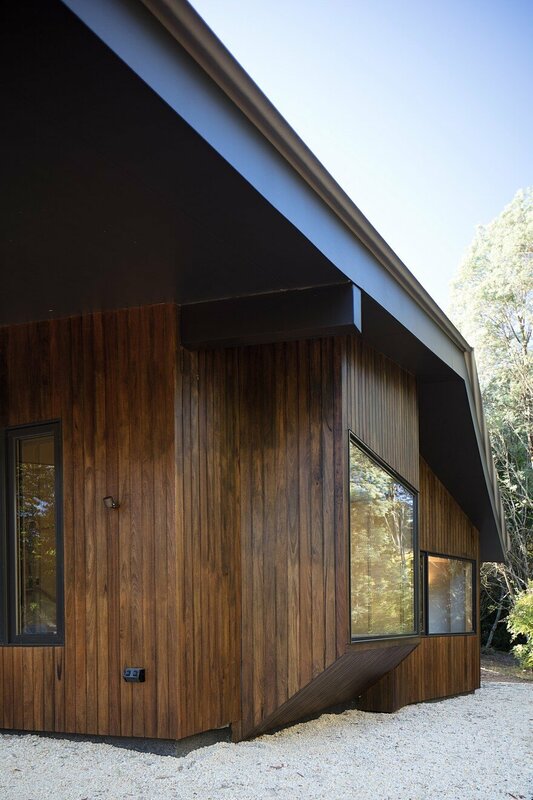 The stained timber cladding clearly defines the new house from the existing, creating the built shadow cast from the outline of the historic weatherboard dwelling. 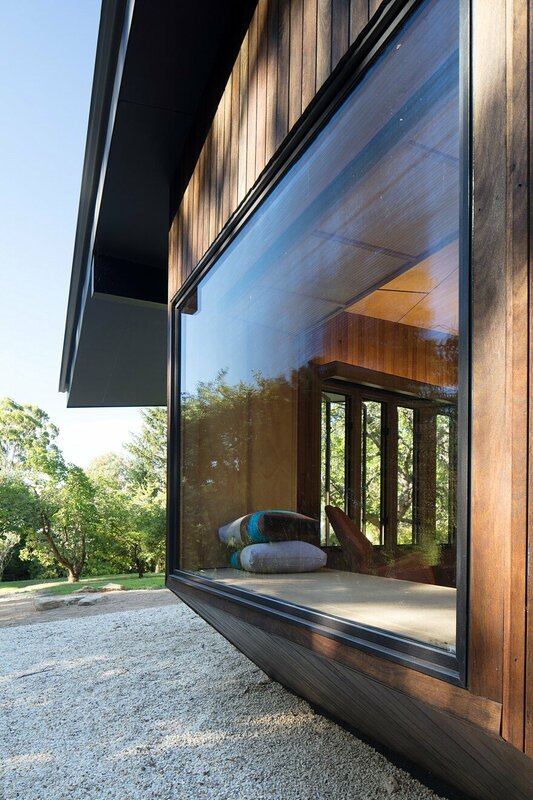 North facing glazing allows low winter light to penetrate deep into the plan and provide passive heating during the cooler months. 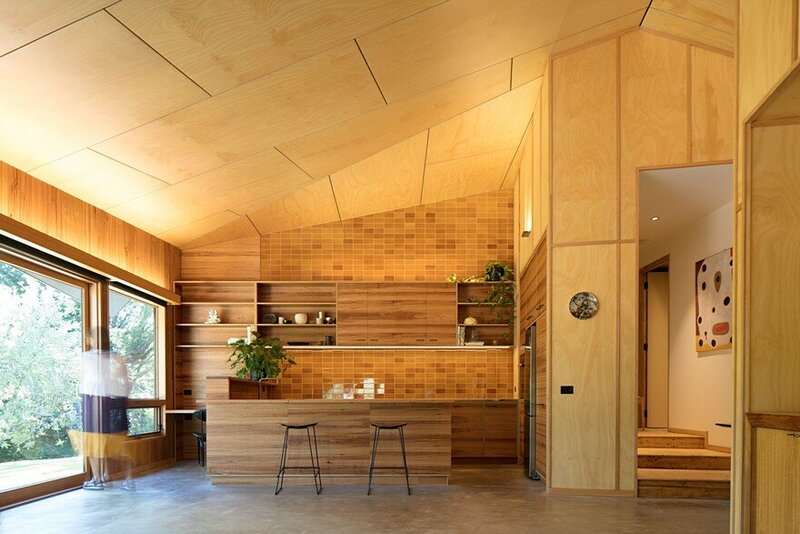 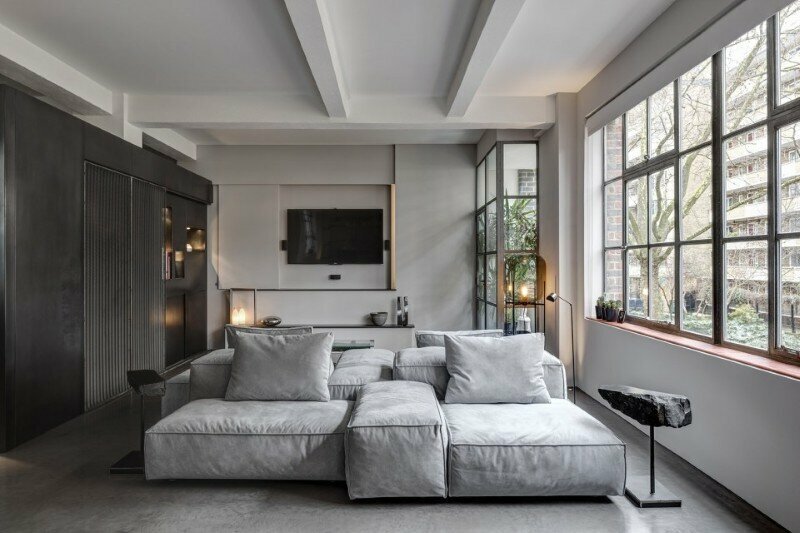 The interior is lined with salvaged timber boards and FSC plywood panels imparting a warm glow to the living spaces, which is enhanced at night by concealed lighting that illuminates the folded timber ceiling, a continuation of the black exterior eaves. 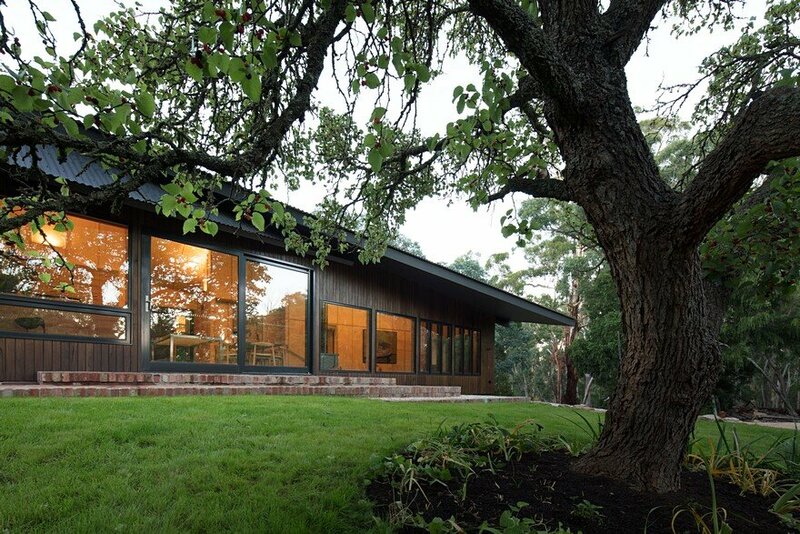 The dramatic roof overhang provides shading to the windows and leads the eye down to the gully and the trees beyond. 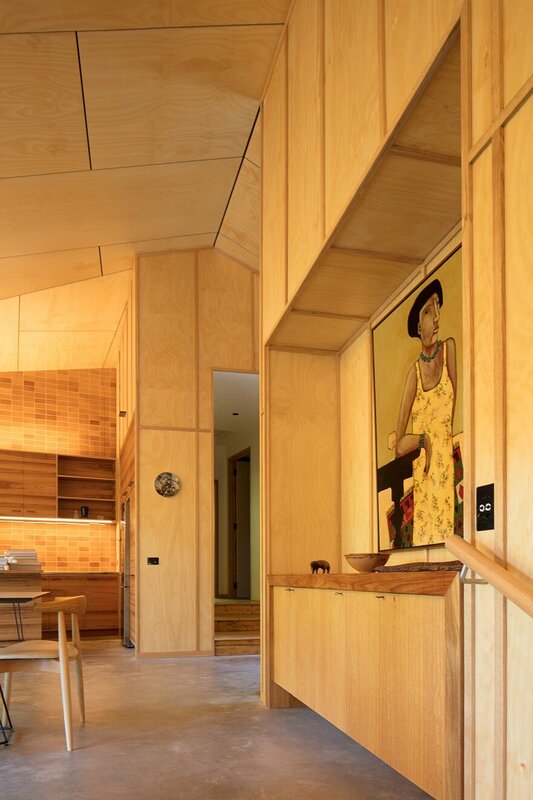 ESD was embedded in the project from its inception and developed collaboratively with the clients. 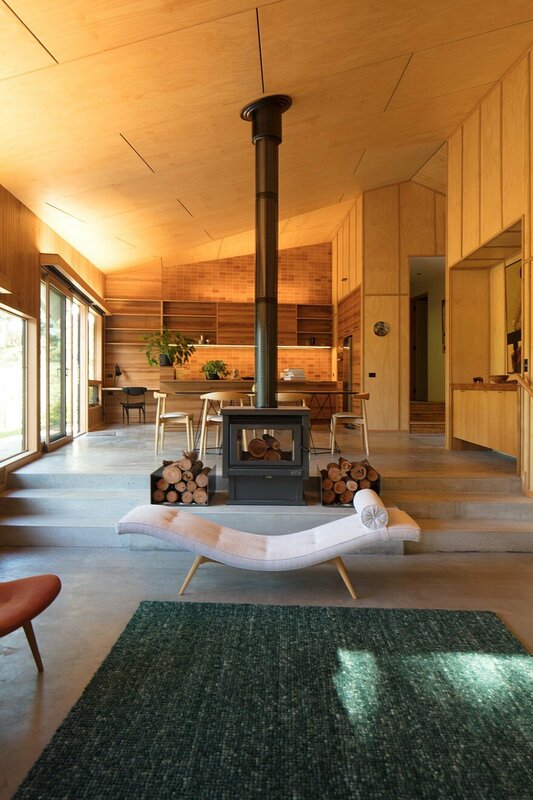 A compact footprint retains the existing frontage and utilises low embodied energy and salvaged materials. 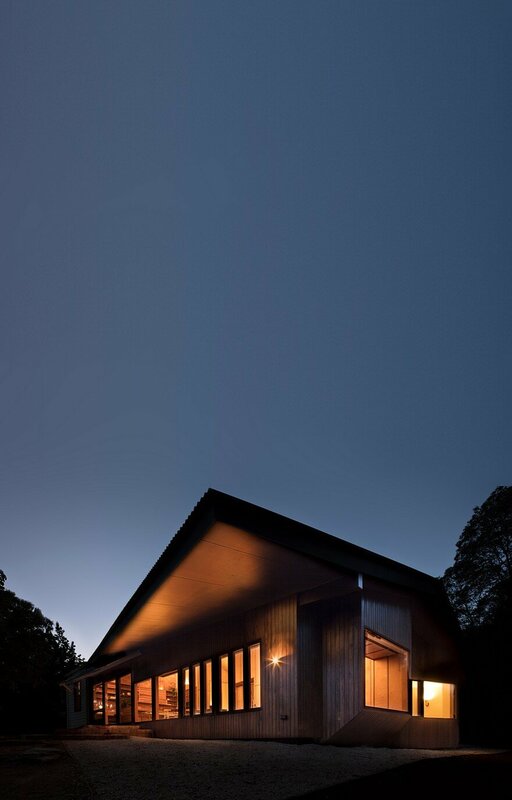 Living spaces are orientated to north with generous eaves optimising seasonal solar access. 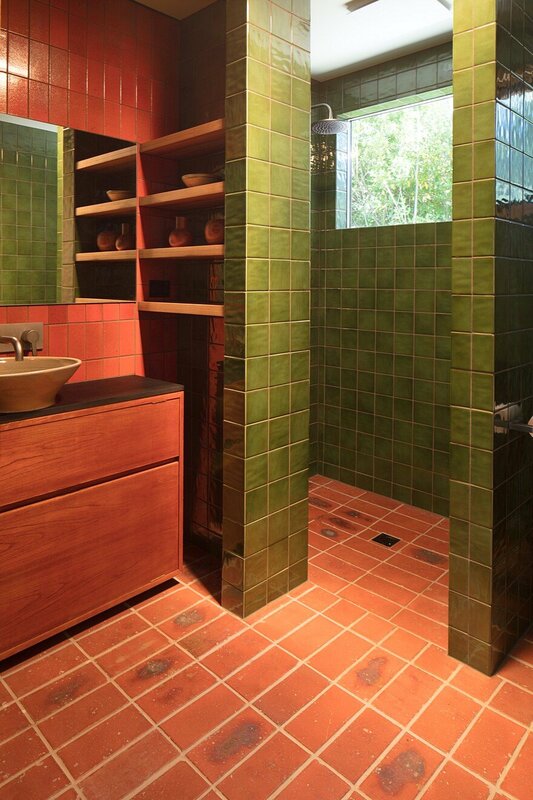 Bathrooms are finished in tiles and pavers that were destined for landfill. 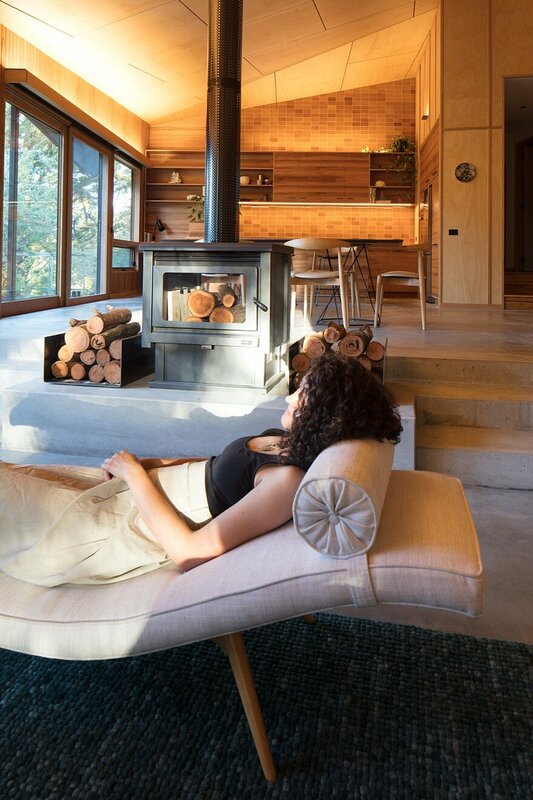 Passive comfort is further enhanced through high level insulation, internalised thermal mass, grey water re-use and cross ventilation through thermally broken windows.